The title of this well respected festival sounds ominous yet on the 3rd and 4th September, the Opera House will insight you with more details. For now, we’re giving you the dramatic overview of what to expect so brace yourselves! The eighth consecutive Festival of Dangerous Ideas (FODI) is a boundary pusher weekend with the who’s who of speakers coming in droves around the planet. Knowledge is power and at FODI, you’ll be enlightened about low down dirty politics (is there any other type? ), vanishing countries and disruptive behavior that affects landscape, the economy and wars. We’re not just talking about the mysterious Bilderberg Group but also about how Brexit’s knock on effect changes the world, border control damages hope and underlying strengths that are positively impacting a snowball of tumbleweeds. Our planet is in turbulent times from terrorism, crime, corruption and an abundance of natural disasters. These events affect our culture, ethics, morals, way of thinking and our free will in rising above these… or being sucked into the cyclone. We find this event incredibly interesting because it covers all bases and isn’t designed to scare the living daylights out of you. Its focus is to provide the information and open food for thought so you are better informed. Topics are set into a very simple timetable per day, hour slot and subject matter by the expert alongside details about purchasing single or multi tickets. From a panel about Breaking a Rule a Day, to America coming apart and Apple vs the FBI (that’ll be a good one!) to Water Wars. Henry Rollins will also present about Blood Sports while Jesse Bering taps into ‘Suicide is Social’ and the impact it makes to a three degrees of separation spin-off effect. How about Laura Secor’s Dissent in Iran? Or Lev Grossman’s There Are No Good Books? We love that a true hard hitting event is returning to Sydney; a city renowned for free and liberal thinking, solid cultural diversity and intelligent beings who question everything in society. Sydney is ideal for this festival and it attracts thousands in droves to learn, challenge and spread the debate. The festival will be a pure brain rush and the conversations will be going on long after the weekend is over. So if you want to get your back brain into gear and attend a truly insightful two day mind power, this is the place to be. We're featured in Expedia's Australia Blog!! Australia is famous the world over for its beach culture. However, the beach can mean many different things to different people. 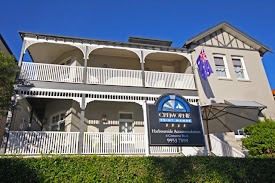 Our location on the North Shore of Sydney Harbour, Cremorne Point Manor is the ideal starting point from which you can experience two different beaches representing two totally different aspects of Australian culture. The closest beach is Balmoral Beach, adjacent to the Botanical Gardens and Taronga Zoo. Balmoral Beach is a beautiful harbour beach surrounded by parklands. Its enclosed designated swimming areas make it a safe place to take the kids, while the adults can try snorkelling or sailing. The beach is also famous for its fresh fish and chips. Manly Beach, a short ferry ride away from the CBD of Sydney or accessible by bus, is bigger and more popular with tourists, backpackers and Sydney locals. Kids can play on the quieter harbour side or brave the wild waters on the beach side. Wandering the markets, shops and restaurants along the pedestrianised Corso mall makes for a perfect weekend afternoon activity. Cremorne Point Manor offers you easy access to these varied beach experiences, along with stunning views of Sydney Harbour and all the amenities you will need for a perfect holiday. For this reason we were thrilled to be recently included in an article by Expedia on 'Australia's Best Beach Accommodation'. Cremorne Point Manor: This restored 19th-century guesthouse offers spectacular harbour views across Mosman Bay to Sydney’s iconic skyline. Situated on one of the North Shore’s quiet leafy streets, it’s just a 20-minute drive to Manly Beach. Soak off the sand in your private spa bath or hot tub. The penthouse suite is ideal for longer stays, with two glamourous bedrooms, a full kitchen and spacious balcony with harbour views. You Ready for World Time Attack Challenge? If you’re in the Sydney area on October 14th and 15th, and you’re a magnet for fast sports, the World Time Attack Challenge (WTAC) has your name written all over it. It started in 2008 when Ian Baker organized the first Superlap Australia event after visiting Japan and competing with the Hi Octane racing team. He loved the scene, the adrenaline and realised that Australia was now ready for this feat. Not only was the tuning shops to be at quick fire speed but the winners of this race would win the World Time Attack Championship title. The first Aussie WTAC was held two years later and generated huge success. Competing against the Japanese and Americans, PanSpeed and R-Magic took to the race and scored their best times. With hype underway, sponsors came on board fast and spectators gravitated from all around the world, setting records for each event. It’s not a cheap motorsport to maintain but since it’s less costly than running a race series in any other class, more international superstars came on board to compete. So in October, you’ll not only get to scream for your winning motorsport idol but this 500m race will see the highest top speed crowned a winner. Fast and furious doesn’t even describe it. Speed of light may be the most appropriate explanation. This lunchtime event also features Turbo Legends and after the race, you can check out the stunt driving exhibitions alongside drifting demos and iconic motors on show. Exhibitors will be there offering expert advice, flogging all relevant motor gear and providing knowledge on turbos, wheels, and anything that sounds like a testosterone infused vroom vroom vroom. But wait…there’s more! The largest outdoor car show in Australia will be featured including vintage to classics, modern performance cars and over the top custom builds that cost a small fortune, or 90210 hefty mortgage. Tickets are reasonably priced so it won’t damage your month end credit card bill. Sydney Motorsport Park is a decent 45 minute drive from Cremorne Point but you’re going to drive safely and sensibly there and back to our Cremorne Point Manor, right? If you’re looking for a finale, end of day adrenaline boost, take a peek at the view of the Harbour from our guest patio. Life may be speeding by on wheels but as the sun goes down in Sydney, it’ll be the biggest rush you’ll experience all day. Remember to tweet WTAC and our Manor with pics. From the 5th – 7th August (10am – 6pm on Saturday and 10am – 5pm Sunday), the Showground at Sydney Olympic Park is hosting the ultimate food & vino lovers festival. If you’re a foodie fanatic or budding sommelier, then the Sydney Good Food & Wine Show is the two day event you must attend. The country’s finest food producers, wineries and chefs team up for a smashing weekend of gluttony. Prices are $27+ for adults, from $18.90 for kids, family packs & concessions. No kid is too young to be learning about nosh so bring along the munchkins for a full day (or two) and learn from the best in the business. One of our favourite agenda line ups of the festival is the celebs & experts, especially the ones on the stage running demos and throwing the audience tiddlers of food along the way. This year’s lineup includes Alastair McLeod, of Irish descent and presenter of Ready Steady Cook. Then there’s Kirrily Waldhorn (aka Beer Diva) who knows the full history of brewing and will update you on a few myths along the way. As the editor of BeerStyle.com.au and VP of Pink Boots Society, supporting women in the beer industry, Kirrily will no doubt keep the audience entertained. Amongst others, there will be Nick Haddow, founder of Bruny Island Cheese Co who will co-present at the cheese master classes. Known as one of the best cheese makers in Oz, he’s sure to get your goat (and cow) with a few churning tricks up his sleeve. If you’re feeling peckish by now, make a note to head to the Grazing Garden and grab a bite – a necessity after such extensive walking around the expo, tasting samples by hundreds of exhibitors. Remember to check the website for a list of all exhibitors, what’s playing at the Good Food Theater, memorize a few event highlights such as Brewers Lane and be involved in Cellar Door – the wine appreciation sessions. It won’t take you more than 30 minutes to get back to Cremorne Point from the Park. And if you’ve worked the expo, you should have quite a few samples – enough to make a late evening picnic on our balcony at Cremorne Point Manor. The views are stunning, the Harbour will be lit up and you’ll be fressing on delicacies that only the expo can offer in abudance. So raise a glass and remember that wine is officially one serving of your daily 5 – it’s all about the grapes.